The locally based team behind a pair of high-profile developments along the downtown canal is looking at a parking lot in the Fan for its next project. 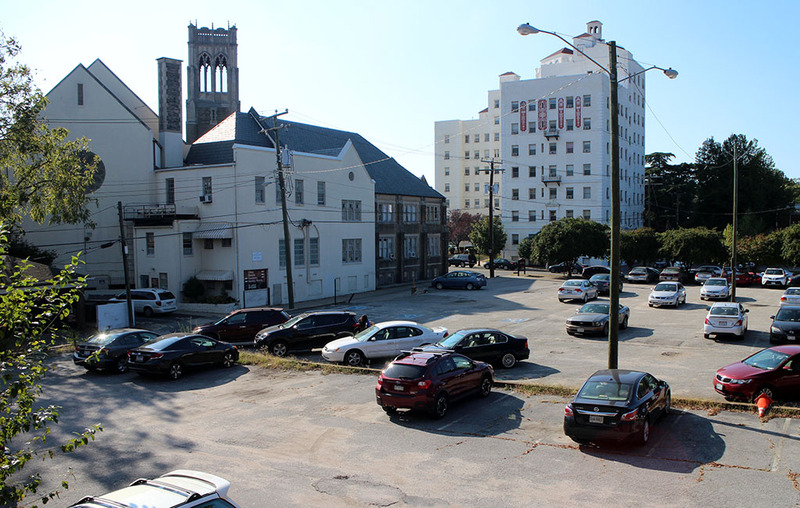 Fountainhead Properties’ Tom Papa is collaborating with WVS Cos.’ Jason Vickers-Smith and Richard Souter on a six-story, 105-unit apartment building at 1131 and 1137 W. Grace St., the site of a parking lot at the corner of Grace and Stuart Circle that is owned by the adjacent St. John’s United Church of Christ. Plans are preliminary and require approval from the city’s Commission of Architectural Review, which was scheduled to provide a conceptual review for the project this week. Existing zoning allows the Grace Street building to be built by right – as well as twice as high as the team is proposing, Papa noted. But he said they’re sticking with six stories because they want the building to fit with the neighborhood. “We’re being very sensitive to making sure that what we build is appropriate for the area,” Papa said. While the nearby Stuart Court Apartments reach as high as 10 stories, adjacent rowhouses on Grace are two and three stories. The building would be the latest project between Fountainhead and WVS, which teamed up on the Locks mixed-use development and are planning a canal-front hotel nearby. Separately, WVS is the developer of Rocketts Landing, and Fountainhead is the company behind a pair of planned towers on the Manchester riverfront. 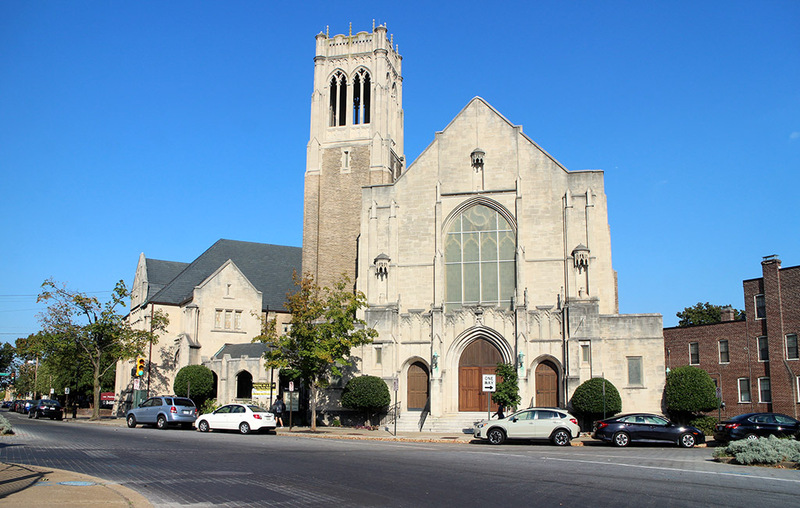 Papa said the project came about when the century-old church – where, he said, Vickers-Smith was married – decided to sell the two parcels to help raise funds for renovations. The parcels were listed by Jeff Cooke with Cushman & Wakefield | Thalhimer, and Papa said his team was one of five development groups that made offers on the site – and the only one, he said, to not propose student housing. Papa said he, Vickers-Smith and Souter are under contract to purchase the 0.8-acre property through an entity called CIRC LLC. Pending CAR and plan of development approvals, he said they’re aiming to start construction on the 18-month project next spring. The group has held several meetings with neighborhood groups to solicit input on the building’s design, which remains conceptual, Papa said. “We’re trying to get input from the community as to materials, and be more sensitive and hear more opinions of what they would like to see,” he said. “What we’re hearing is pretty uniform across the board: that they’d like to see brick and something that isn’t pretend-old and that respects properties’ aesthetics around it. The building would consist of five levels of apartments above two levels of parking, one of which would be underground. Forty parking spaces would be reserved for St. John’s, including 16 surface spaces that would be provided in addition to the 130 spaces in the structure, which would not be visible to pedestrians along the street. The apartments would range from 650 square feet for a one-bedroom, one-bathroom unit to 900 square feet for a two-bedroom, 1½-bath. Papa said rents would be market-rate and have yet to be set. He said the overall cost of the project is likewise variable, dependent on the building materials and other details decided. “All of the folks in the neighborhood have actually been very supportive,” Papa said. “People have the usual concerns about what’s going to happen with all these (additional residents). We are very sensitive to that. The group is working with Lory Markham of Markham Planning on its applications to the city. Walter Parks Architects is signed on to design the building. 8 Comments on "Developers plan 105 units in the Fan"
An excellent use for that parking lot! Besides that it’ll block the view of the Stuart Court Apartments which desperately need upgrades. Congrats to Tom, Rick and Richard for winning the bid to buy this property. This will be an excellent use of this site. The inclusion of off street parking will lessen the impact on the surrounding properties as well as improve the marketability of the units. A 2nd full bath instead of a half would be nice. I can’t believe the obsession with automobile parking. Try walking for a change. When people are walking where are they going to put their car they use for longer trips like the grocery store or visit relatives. As the urban areas continue to increase their offerings there will be less of a need for cars but I bet there will still be an average of 1 car/unit. Plus the level of parking they are putting in is likely required by zoning code so work with the City to get those requirements decreased. This is the problem with Richmond, we don’t have the infrastructure to be a walkable city. Cities like New York you can absolutely live without a car but Richmond isn’t setup for it and probably never will. Richmond is a small city with big city dreams that can’t get out of it’s own way to advance. Even people who walk when they can still need a place to park thier cars. And trying to park in that area is a nightmare. One space per ~unit~ l is just not enough. Needs to be one spaces per bedroom.